It's the multi-player board game based on the addictive Sudoku puzzle craze! Players attempt to complete it, competing against each other and the clock. Can be played with 2-4 players or alone. Suitable for ages 8 and Up. This handsome edition of the world popular Sudoku has quality features that every fan will appreciate. For 1 player ages 8 and up. The number puzzle that's been rocketed to a worldwide craze now comes in a form great for younger minds! Do You Sudoku? For kids uses six animal symbols on a grid composed of six 3x2 boxes. Great for discovering patterns and developing logical thinking skills! Ages 6 and up. Sudoku goes technical with Do You Sudoku? Electronic game! 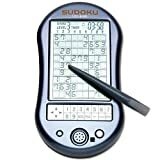 Programmed with over 10,000 Sudoku puzzles and featuring a 2 line, 14-character LCD display, this is the must-have for the Sudoku enthusiast! Based on the best selling book - If you're interested in experiencing Sudoku or getting better at solving the puzzles, Sudoku for Dummies is for you. For 2 or more players ages 8 and up. 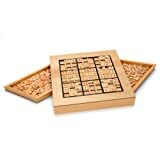 This is the nicest wooden Sudoku board game that we have seen. The wood board is beautifully finished with pull-out drawers and comes with 2 sided playing pieces. Sudoku is a worldwide hit, and now we've made it even easier for the whole family to enjoy. This game can be played individually, competitively, as well as in a group setting. Sudoku is recommended by many teachers as an exercise in logical reasoning. Every puzzle has a single, unique solution. Enjoy! If you're a fan of Sudoku, you and your family will love this colorful alternative. Instead of using numbers to solve the puzzles, Colorku uses brightly colored wooden balls. The gameboard-crafted of solid wood-includes 81 balls in 9 different colors, 104 puzzle cards, solutions booklet, color conversion card and storage tray. There are 5 levels of difficulty. Place it on the coffee table and you're ready whenever you feel like a challenge. Also makes a decorative art piece. What is Sudoku? It is a logic-based number placement puzzle. The object of the game is to fill a 9x9 grid with a number so that every row and column have a number from 1-9 with no repeats and each 3x3 grid has a number from 1-9 with no repeats. The puzzles start with a partially completed grid and the players must fill in the rest. 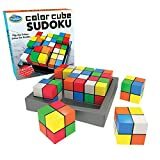 WHAT YOU GET - 9 well made color cubes, a game tray, and bonus challenges for ages 8+. DEVELOPS CRITICAL SKILLS - Builds logic and problem solving skills through fun gameplay. AWARD WINNER - Toy Insider Top Holiday Toys Award, ASTRA Best Toys for Kids Finalist, Parents Choice Gold Award and more. With more than 100,000 puzzles, Sodoku offers mind-challenging fun that you can play anywhere. A game that can train logical thinking, many math workers use Sudoku to ignite students' interest in math. Train the logical thinking ability, ignite the students interested in mathematics. 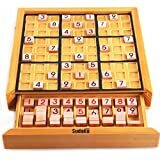 Sudoku , originally called Number Place is a logic-based, combinatorial number-placement puzzle. The objective is to fill a 9×9 grid with digits so that each column, each row, and each of the nine 3×3 subgrids that compose the grid contains all of the digits from 1 to 9. The puzzle setter provides a partially completed grid, which for a well-posed puzzle has a single solution. Loved by players of every age and skill level, the goal of Sudoku - a fun, addictive logic game - is to fill all 81 spaces on the 9x9 playing area with numbers, such that all digits 1-9 are used once per row, per column and per 3x3 region. Designed with balance in mind, our innovative approach to Sudoku equally engages both halves of the brain - the left side works on numerical challenges and reasoning while the right side focuses on color patterns and creativity. Although the large game board and colorful numbered pieces are designed to be enjoyed collaboratively with a partner, it's just as fun to play individually. Value Highlights: Teach kids numbers and logic by playing a game; Have fun while collaborating with a friend using teamwork; Engage your right brain at the same time with colors and creativity; Set smooth rounded pieces on a large board and Engage your senses with a hands-on tactile experience. Each Set includes: 1) Game Board (11.4" x 11.4") with Colored areas easy to distinguish each 3x3 region and indented round spaces to keep everything in place. 2) Round Game Pieces (216) includes, 81 primary game pieces which are identifiable by both colors and numbers and has a black or white star on its reverse side for use in other games, and 135 secondary game pieces with 15 of each number which are smooth and can move and slide easily. 3) Covered Storage Tray for easy to organize and store game pieces with ergonomic, rounded design which makes accessing the smooth game pieces easy. 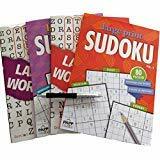 4) Sukugo® Booklet with game instructions and 100 Sudoku games (10 levels of difficulty) and solutions. And 5) Carrying Case with Padded, zipper-closing case fits easily on a bookshelf and external pocket holds game piece tray and booklet. Play the fascinating game of Sudoku in a fun hand-held electronic game. The LED screen is easy to read. Measures 2-3/4" wide x 4-3/4" long x 3/4" deep. 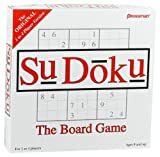 Play the fascinating game of Sudoku in a fun hand-held electronic game. Featuring three levels of difficulty and includes sound function, memory function, sleep mode and automatic answer correction to check your answers. The LED screen is easy to read. Measures 2-3/4" wide x 4-3/4" long x 3/4" deep. Requires 2 AAA batteries, not included. Instructions included. PRE5205 The wildly popular game of placing numbers in a 1 to 4 player top quality version! 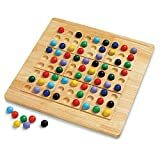 The numbers fit into the grid on the board for no-mess play and colerful player markers tell who placed which numbers when it's time to reveal the solution and add up the points. This product is created by a mom who understands the importance of keeping your brain young, vibrant and elastic. This puzzle books pack is a great gift for any adults or seniors who enjoy doing a little brain exercises every day. For those who think brain games are only for seniors: Did you know that our memory actually begins to slip in our early 20s? Meaning that seniors are no longer the sole beneficiaries of these fun puzzles and games. If you would like to enjoy a successful, independent and healthy life ahead of you, incorporating these brain games early in your life could make a big difference..
Research done at Trinity College in Dublin concluded, "mental stimulation over puzzles like crosswords and Sudokus can help fight off degeneration in brain function." Brains can acquire new cells throughout life if you continue to stimulate them. There is no better way to stimulate your brain than doing these fun brain games puzzles on a daily basis. This Electronic Sudoku Handheld Game is the ideal game pack for the word and number puzzle enthusiasts! Features 3 skill levels, thousands of games, timer, hints & clues, and an automatic solution. Batteries included.